PennsylvAsia: Chenrezig Sand Mandala design and construction at Pittsburgh Center for the Arts, February 4 through 9. 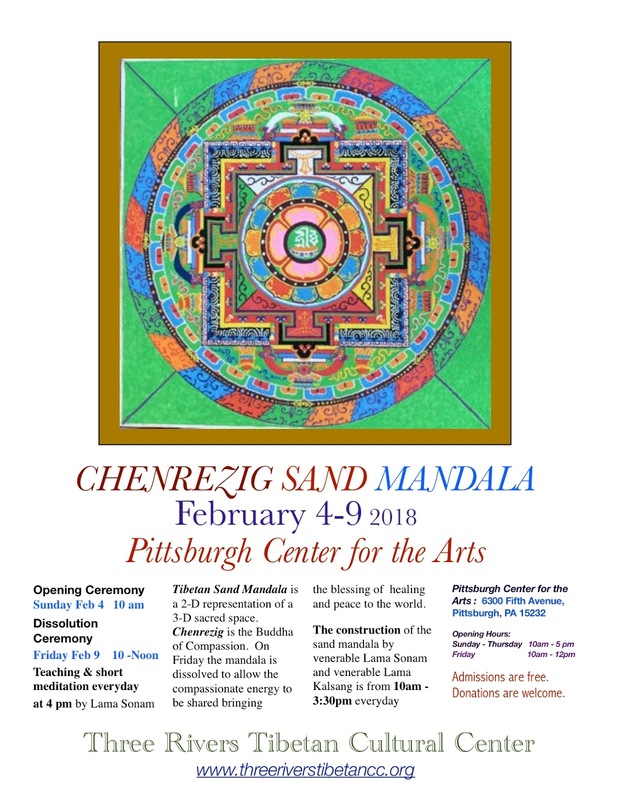 Chenrezig Sand Mandala design and construction at Pittsburgh Center for the Arts, February 4 through 9. The Pittsburgh Center for the Arts will host two Tibetan Lama from the Three Rivers Tibetan Cultural Center from February 4 through February 9 as they design and construct a Chenrezig Sand Mandala. Tibetan Sand Mandala is a 2-D representation of a 3-D sacred space. Chenrezig is the Buddha of Compassion. On Friday the mandala is dissolved to allow the compassionate energy to be shared bringing the blessing of healing and peace to the world. The construction of the sand mandala by venerable Lama Sonam and venerable Lama Kalsang is from 10am - 3:30pm everyday. The opening ceremony is Monday, February 4, at 10:00 am, and the dissolving ceremony is February 9 at 12:00 noon. The Pittsburgh Center for the Ats is located at 6300 Fifth Ave in Shadyside (map). Admission is free but donations are welcomed.